The climate in the Dry Tortugas is subtropical, which basically means that it has warm and tropical weather in the range of 60°F to 90°F. The temperatures in the Dry Tortugas range from the mid-50s (as a low during the coldest months in winter time) to the mid-80s. The two main seasons are the winter stormy season from December through March which is windier and sees slightly rougher seas, and the summertime tropical storm season from June through November where there is a higher chance of isolated storms (including tropical storms and hurricanes). The weather out on the Dry Tortugas is very similar to a lot of other tropical Caribbean island environments. The climate is subtropical with hot and humid summers and frequent afternoon showers. The winter times are milder in temperature and drier in general. In the summertime, it is not uncommon for the temperature out on the Dry Tortugas to exceed 90 degrees Fahrenheit. The average temperature in the summer is in the mid 80s. In the wintertime, the average temperature is in the mid sixties. Though the summer seas are not as rough, the summertime hurricane season threatens the islands with spontaneous hurricanes that can be quite powerful even if they are well off in distance from the Dry Tortugas. 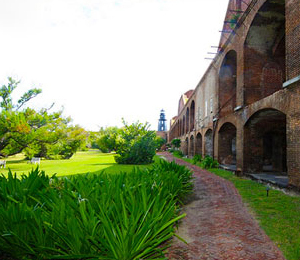 Most people agree that the best time to visit the Dry Tortugas is from the months of November through April. The Key West seas (both out on the Gulf of Mexico and the Atlantic Ocean) tend to be rougher and the winds stronger from October through January. Thus, the best time to come out to the Dry Tortugas is probably from February through April. Unfortunately, these are also the busiest months down in Key West. For this reason, our charters that head out to the Dry Tortugas tend to be completely filled up during these months, making it more difficult to be able to get out to the Dry Tortugas during your visit. Our recommendation is to book your spaces well in advance if you plan on coming during these months. Your trip out to the Dry Tortugas will be unforgettable no matter when you come. The weather is always pleasant to guests, though of course it is unbeatable during the early spring months, thanks to the lack of hot weather, rains, or heavy winds. It's always smart to bring sunscreen, even if you are coming in the cooler winter months. Hats and sunglasses are also a good idea.